The first stages of the design process of this project can be seen here and here. Time - Or more accurately lack of time. A considerable amount of time has now elapsed whilst decisions were made by the Local Authority regarding the Margam Park Forest garden project. 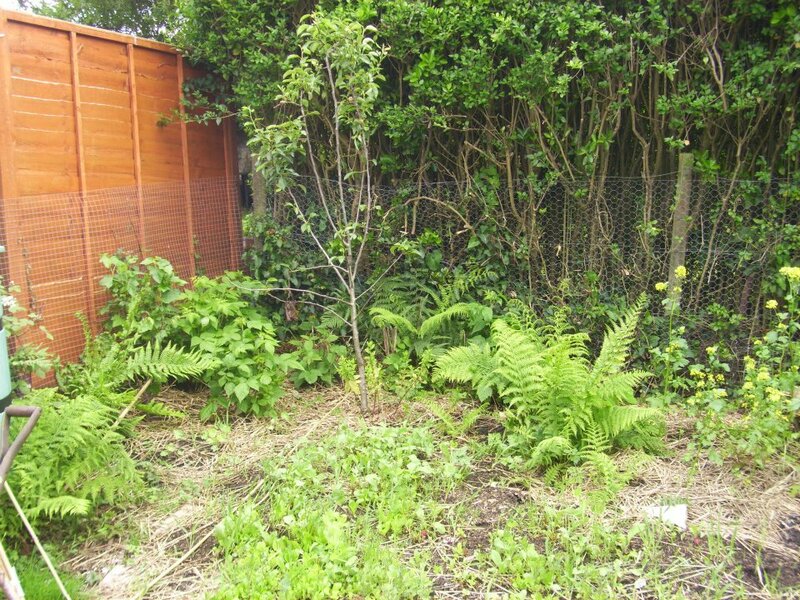 Although funding had been successfully sourced to cover the cost of deer fencing (the greatest initial expanse) pond excavation and fruit trees, part of the conditions attached to the funding included a time limit by which the money could be spent. The extremely slow decision making process on this occasion meant that the time period to take advantage of the funding on offer had elapsed by the time the decisions had finally been made. 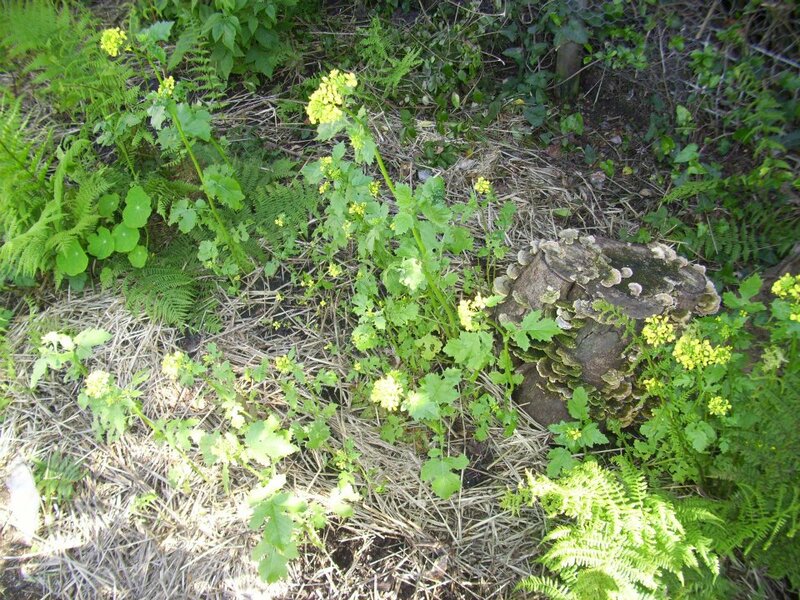 Glyphosates - The contractors employed by the Local Authority to undertake the clearance work intend to utilise glyphosates to treat the regenerative stump growth. As previously explained, research clearly indicates that glyphosates leave a long lasting and harmful residue in the soil that is totally indiscriminate - hardly conducive with establishing a forest garden. Despite efforts to persuade otherwise, there was no compromise to be reached and the local Authority would not budge from their agreement with the contractors to undertake a programme of spraying with glyphosates. I have had to make the decision to focus my time toward other projects that are developing more positively rather than devote further time and energy toward one which at this point in time, has too many "spanners in the works" to efficiently and effectively implement the design process. However, I will briefly describe how I would have gone about tackling the chief problems presented here. Glyphosates have been available World wide as the Monsanto Product "Round up", the most regularly used herbicide for the past 30 years. "Biodegradable and good for the environment"
Monsanto have since been successfully prosecuted for false advertising, once in 1996 in New York and again in France more recently in 2007. The fines involved with such prosecutions are a fraction of the profits made by organisations as large as Monanto. The wording of the advertising is restructured, few people are any the wiser, and the product continues to be sold worldwide. Biodegradable and good for the environment - According to tests by Monsanto itself; Only 2% of the product breaks down after 28 days. Many scientific studies have also shown that round up is highly toxic. For example; it promotes cell division disfunction as demonstrated in a study by Professor Robert Belle. Professor Belle works for the French National centre for Scientific Research as well as the Pierre and Marie curie institute in France. Quoting him; "Round up provokes the first stages that lead to cancer"
Ken Cook, President of the Environmental working group "We would never trust a company like Monsanto to tell the truth about a pollution problem or a product." In March 2012 I began a simple experiment. I felled a Rhododendron ponticum that was established in the garden at home. 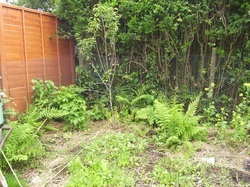 As you can see in the image to the left, it left a substantial stump when compared with the chain saw. 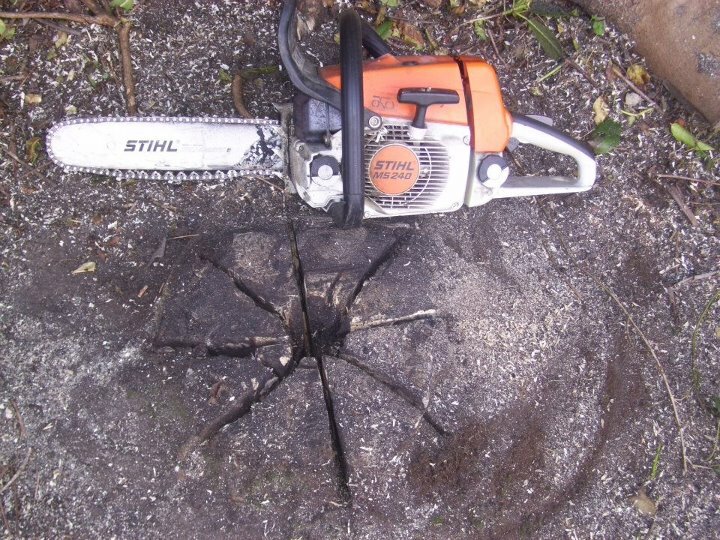 My tactic was to divide the stump by cutting four cuts crossing one another and forming an eight pointed star. 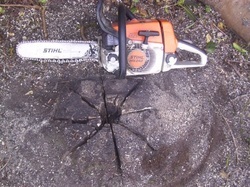 In the centre of the star, which also represented the heart of the stump itself, I also delivered a vertical plunge cut with the chain saw as deep as the chainsaw blade would allow. Working from the deep centre plunge cut, I then worked the chainsaw blade back out to the ends of the points of the stars ensuring that the cuts became shallower as I reached the outermost point of the cuts. My thinking behind this methodology was to create a trap for water, right in the heart of the stump. When rain the spring rain fell, it would find it`s way easily to the centre of the stump and sit there. My objective being that this would increase the likelihood of the stump rotting. I sheet mulched over the entire area with thick layers of soaked cardboard over-laid with a thick layer of home produced compost. 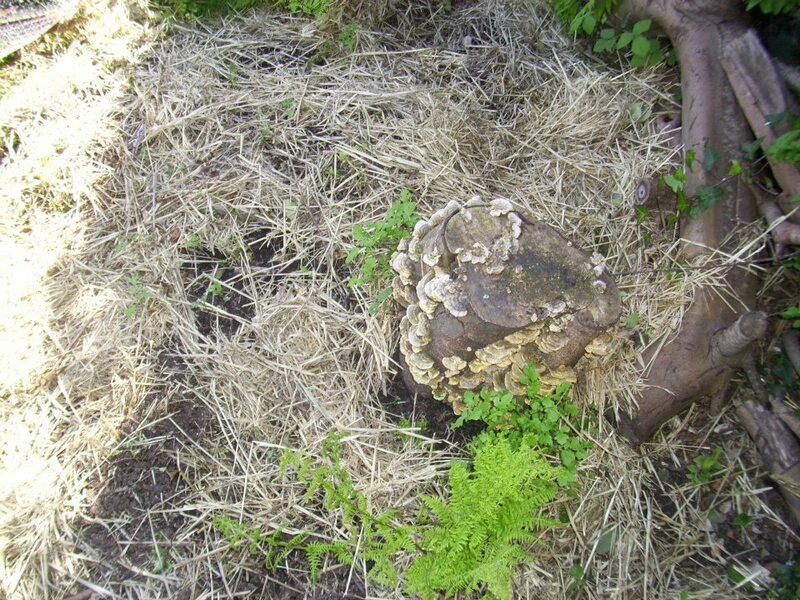 I also added soil from beneath a pile of logs elsewhere in the garden that were fruiting well with fungi, hoping that the mycelium would be transferred across to the site. 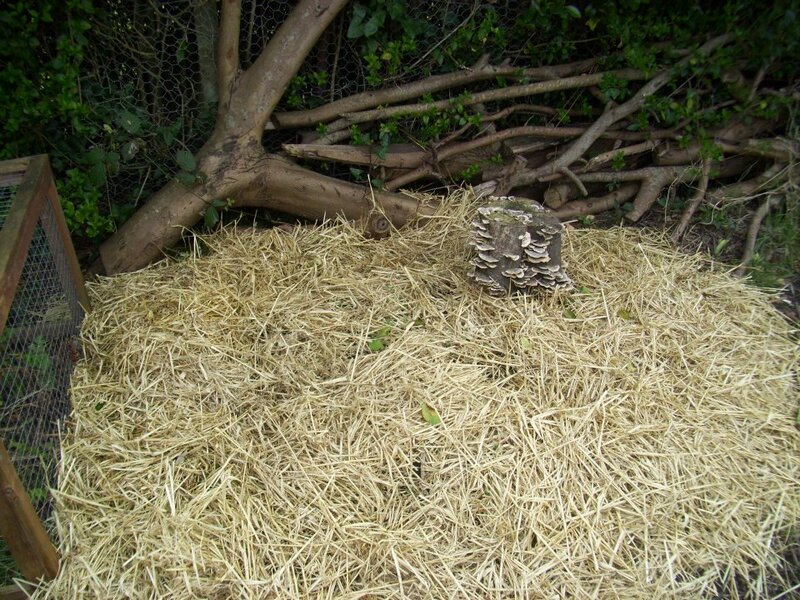 I surface mulched the area with straw, threw in a mixture of the seeds of various plants as well as a log from the fungal fruiting log pile for good measure. (The timber in the back ground is from the eucalyptus tree felled last year which has since been integrated into a hugleculture mound). Germinating seeds began to sprout at the site in May and ferns can also be seen in the image to the right coming through at the edge of the sheet mulch. No sign of Rhododendron regeneration though. 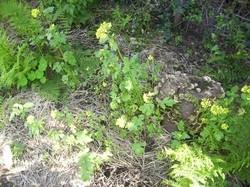 Early june and mustard seed, nasturtiums and ferns are developing. Still no sign of Rhododenron regenerative growth. Looking across at the site in mid june. Things are flourishing, but not the rhododendron. Another view of the site at the end of June. 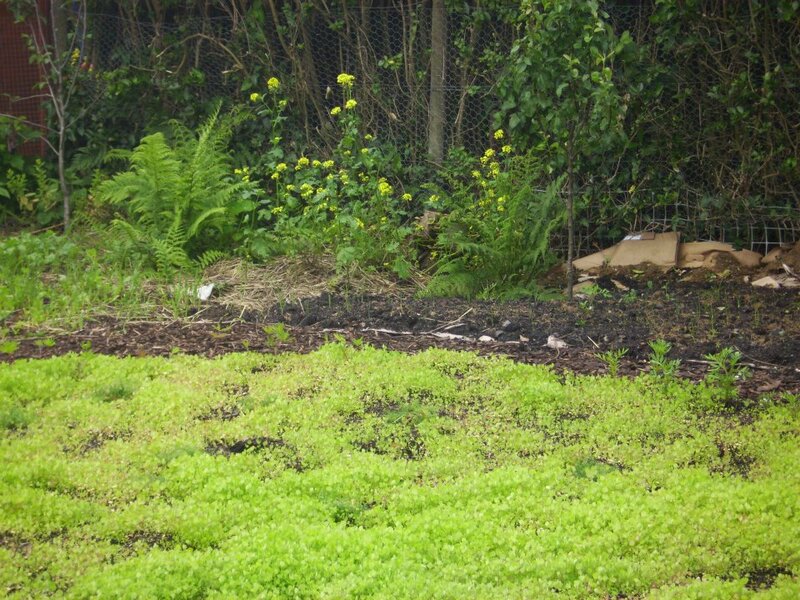 A small polyculture has been planted in the foreground. I think at this stage, three and a half months later in the season of new growth, that it is safe to assume that there will be no Rhododendron stump regeneration. If this small experiment is anything to go by, there is the potential to treat the stumps in such a manner even in large stands of Rhododendron. The extra time spent with the chainsaw implementing the plunge cuts into the heart of the stump could well eliminate the use of glyphosates. It is a methodology that I would certainly experiment further with and the Margam Forest Garden project would have been an ideal opportunity to do so. In the case of Margam, in addition to the plunge cut treatment of the stumps my plan of attack would have been to implement multiple "Hot" compost piles directly on top of the stumps. 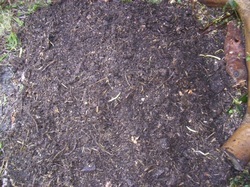 An explanation of Hot 18 day composting is available here. 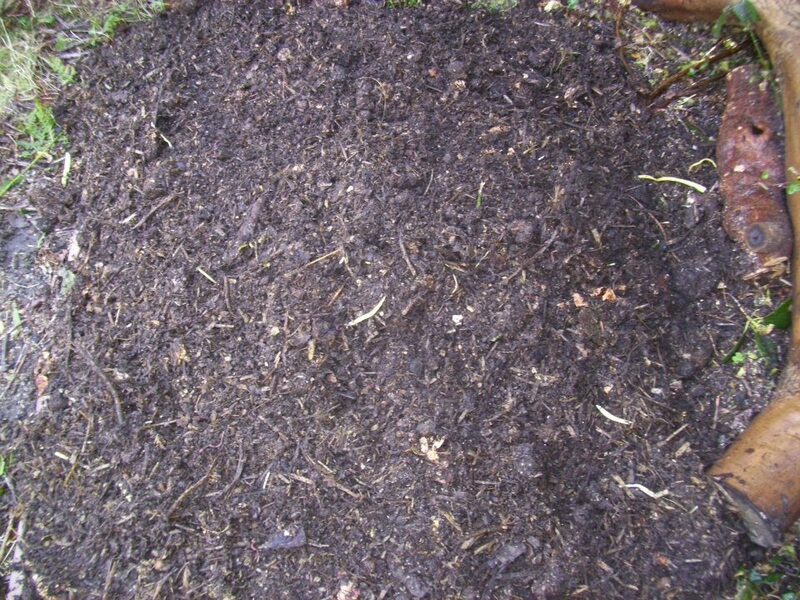 The combination of Rhododendron stump treatment and 18 day composting rebuilding soil structure could also be integrated with the use of dolomite to reduce acidity as suggested by Phil Corbett. In addition, the track above the site could be used to harvest water and direct it down the gradient at which the forest gardening would have been implemented. As it is a fairly steep gradient, already partly terraced, a system of swales could aid water retention at the site. With the Rhododendron out of the equation and soil improvements and water retention landscaping in place the site would very quickly evolve from an acidic desert of no benefit to people or animals to a garden of abundance with significantly improved levels of biodiversity and food production for people as well as the higher than natural density of Park deer, which currently cost a significant amount to feed with foodstuffs imported to the site rather than growing fodder on site - a singularly unsustainable way to manage a deer herd. Leaving room in the design for outdoor classrooms would increase the educational resources at the Park substantially, potentially effecting the delivery of a multitude of crafts, skills, habitat management techniques and food growing methodologies that are not currently on offer at the Park. The design also provides the opportunity for courses to be held at the site, potentially increasing revenue. The Local Authority`s remit of addressing physical activity levels amongst the local population could also have been met with the diversity of activities that the project would potentially have included in addition to meeting other targets such as improving knowledge and experience of healthier diets. Implementing the "Own rootstock coppiced orchard concept" would also have been an interesting and worthwhile experiment. Awareness would have been raised on many levels with regard to regenerative agriculture methodology with the potential to evolve, improve and learn. It certainly presents a prototype model of design that has enormous potential to re-integrate people into the landscape. As discussed above, fine tuning the project design would be an ongoing and evolving process, taking into account the feedback and evaluation insight gained from all project participants and observers. As I am unable to document this part of the project accurately I will instead reflect on what I have learnt from this design process. A considerable amount! Has it been a waste of my time and energy? I don`t think so! I have been introduced to the Own rootstock coppiced orchard concept which I may not otherwise have discovered. It is an interesting concept certainly worth further exploration, one that I will always consider with future projects and one that I also hope others that read this may consider experimenting with should they be presented with the opportunity to do so. I have expanded my knowledge regarding Glyphosates and how damaging they are to ecosystems and human health. I have gained further experience in sourcing funding, and been successful in doing so. I have been driven to experiment with Rhododendron control and learnt a great deal in the process, discovering a potentially very useful methodology to experiment with and tweak further. I have learnt that it is wise to allow more time for such projects, and that I cannot always rely on external potential project partners to address matters with the same level of urgency that I may consider necessary.